The Ilya Muromets is the first icebreaker built for the Navy in 45 years. The Project 21180 icebreaker Ilya Muromets intended for the Russian Navy was floated out at JSC Admiralty Shipyards on June 10, an Interfax correspondent said. "We are now floating out a supplier icebreaker with broad functions after a five-year interval," Alexander Buzakov, general director of the enterprise, said at the ceremony. He emphasized that the vessel will be provided to the fleet within the period stipulated by the contract. The construction of the diesel-electric icebreaker began at the shipyard in April 2015. It is expected to be provided to the fleet in 2017. 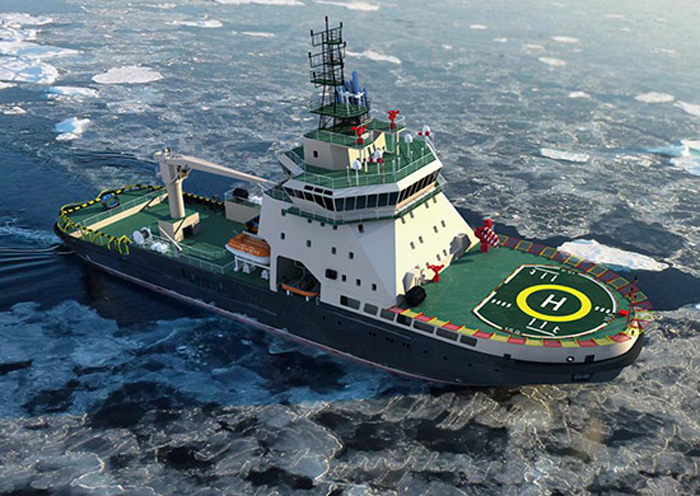 The icebreaker will fulfill missions in the Arctic seas, breaking ice as thick as 80 centimeters. The cruising endurance of the non-nuclear icebreaker will be some 12,000 miles and its cruising capacity will be two months. The Ilya Muromets is the first icebreaker built for the Navy in 45 years. The vessel is intended for icebreaker logistics, basing and deployment of fleet forces in icy conditions, and also tug support of ships. The icebreaker has a displacement of 6,000 tonnes, it is 84 meters long and 20 meters wide, its truss width is ten meters, and its water draught is seven meters. The icebreaker has a crew of 32 people. The head icebreaker is expected to serve in the Northern fleet. A series of four such vessels is due to be built in the future. JSC Admiralty Shipyards specializes in the construction of submarines and oil tankers. The enterprise is part of JSC United Shipbuilding Corporation.